…and many more devastating things like this. There’s something that we should probably be taking to heart. This is specifically to anybody who leads a group of kids in any sort of ministry environment and not necessarily all of my BFF’s at any of the North Point campuses. I have no doubt that at times, during “small group time” you probably hear your kids say stuff like “I’m sad because my great aunt’s dog choked on a ball of hair and she was really scared, so I would like to pray for her dog.” This is usually with the younger crowd, but of course it’s not to be dismissed because these kids are genuinely sharing about the greatest “deal” in their life at that possible moment. If they’re comfortable enough to share with you now, then you hope that when they grow up and mature they’ll want to share just a little more. These are real stories, from real people, and it’s really sad. So what do we, as leaders do? We listen to them, we guide them, we love on them, we hug them, and we try to tell them it’s OK and that it’s not their fault. We try to tell them that they weren’t meant to be in that position. Ever. We tell them that there is somebody so much greater than their problem, and we tell them that there is Hope. We put a label on this problem, acknowledge that it’s real, and take a black bead to represent this “problem” they need to give to God to handle. 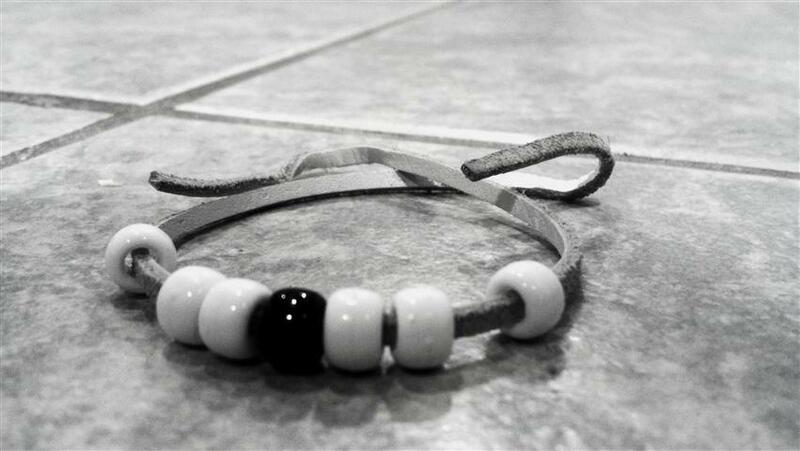 This bead will remind them that this problem is His, and they need to put their faith in Him. Not lean on what the world has to offer, and also not to try to figure this out by themselves, but with Him. Yet as leaders, we sometimes tend to put all of these problems in a box that we own. Especially for me, sometimes I forget that what I’m telling them to do is what I need to do myself. My black bead, is my 7th grade small group of boys. I can’t prevent any of the hurt that is going on in these boys lives, and as much as I would LOVE to, I just can’t walk behind them with a baseball bat to protect them from evil 24/7. What I can do is pray that God reminds me that my 3 children have a father who can one day be the headliner to those horror stories as well, because I don’t EVER want to have them have to share some of the stuff that the other leaders told me the kids in their group shared. Ever. I can also remember what these guys are telling me right now, and pray that they will learn God’s will for their lives, but ultimately I need to remember to place my faith in Him that He’s going to handle what we were never meant to handle on our own. I can’t fix their problems, and I can’t mend their hearts. Only He can. Do you have a “black bead” that you need to give to Him to handle? And yes…I do have a “black bead” that I need to give to God to handle. Thanks for stopping by Thomas, I think for the children involved having that visual of a black bead definitely helps remind them that it’s not their own to bear. Love this post…..lots of wisdom and still learning everyday how to deal with the black bead. Thanks for the insights and being “in tune” with the Lord’s Spirit.